Have you ever sent Santa a thank you card? Maybe I should have. 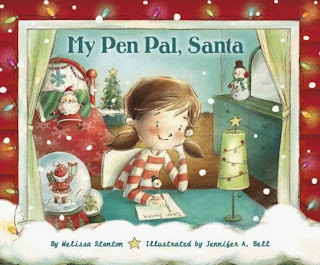 I had lots of pen pal friends, but none of them were as exciting as Santa! Random House Children's Books sent me a copy of this book for review (thank you). It's currently available at your local bookstore and would be a great Christmas gift for a young one. Ava liked her Christmas presents and wrote to Santa about it. Imagine her surprise when he writes back! He's surprised that she is writing to him after Christmas instead of begging for gifts before. This starts a letter writing spree that is really cute. Ava writes on all the holidays, is amazed to find he knows the tooth fairy, talks about her brother the "unbeliever" and more. Each set of letters is fun to read and really special. I really like the way Ms. Stanton presented the story and Jennifer A Bell's illustrations are whimsical and full of color. The book is put together well and a joy to read. Why not get a copy for your house? Maybe you could start your own Santa letters?